Israeli Prime Minister Ehud Olmert said Sunday he would push ahead with the army's widescale offensive in the Gaza Strip, saying the fight to free an abducted soldier and stop militant rocket fire would last for a "long time." The 12-day-old operation has caused widespread destruction in Gaza, left 51 Palestinians dead and led to international complaints that Israel was using excessive force. An Israeli airstrike targeted a car Sunday night carrying Hamas militants near Gaza City, wounding five people, including an 8-year-old girl, Palestinian health officials said. The vehicle was filled with explosives, which led to a series of large secondary explosions, the army said. Just after midnight, Israeli aircraft attacked a building on the outskirts of Gaza City, setting it on fire, Palestinians said. No injuries were reported. The military said the building was used by Islamic Jihad to make weapons. Despite the offensive, Palestinian militants launched three rockets into Israel on Sunday, moderately wounding one person in the Israeli town of Sderot and damaging a house. 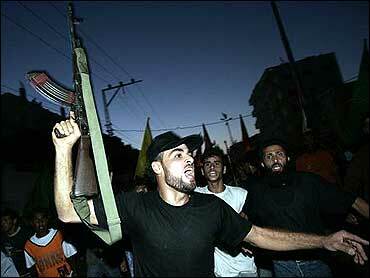 And militants linked to the Palestinians' ruling Hamas party maintained their refusal to free Cpl. Gilad Shalit, who was captured in a June 25 raid — or even reveal his condition. But as the death toll in Gaza rises along with the anger, attempts to find a diplomatic solution are foundering, CBS News correspondent Sheila MacVicar reports. Speaking to the Israeli Cabinet on Sunday, Olmert counseled patience. "We're talking about a war that will continue for a long time and it is complicated," Olmert said, according to a participant in the meeting. "This is a war for which we cannot set down a timetable and we can't say how long it will continue." But he also said there will be no truce until the captured Israeli soldier is freed, MacVicar reports. The Israeli Cabinet expressed unanimous support for the military action in Gaza and Olmert's refusal to negotiate with the Hamas-linked militants, who demanded the release of 1,500 Palestinian prisoners in exchange for information about Shalit. Israeli security officials told the Cabinet that the offensive, the army's largest operation in Gaza since Israel withdrew from the territory last summer, was likely to force the militants to scale back their demands, according to the participant in the meeting, who spoke on condition of anonymity because the meeting was closed. But Palestinians were widely supportive of the militants' actions. A poll released Sunday showed that 77 percent of those questioned backed Shalit's kidnapping and 67 percent said they supported further abductions. Sixty-nine percent said the soldier should only be released in exchange for prisoners. The survey of 1,197 Palestinians by the Jerusalem Media and Communication Center had a margin of error of three percentage points. Olmert told the Cabinet that before Shalit was captured, he had been planning a prisoner release as a goodwill gesture to moderate Palestinian President Mahmoud Abbas, but now, a release appears out of the question. "It's not a secret before the kidnapping that we would free prisoners. But we intended to release them to moderate elements and not to terrorist elements," Olmert said. "The release of prisoners means destroying the moderates in the Palestinian Authority, and would signal to the world that Israel can only talk to extremists." Since the offensive began June 28, Israeli forces have battered Gaza with artillery barrages and airstrikes. One airstrike Sunday missed a car carrying members of a Hamas rocket squad and killed a bystander instead, Palestinian health officials said. The army confirmed it carried out an airstrike. The United Nations blamed Israel for widespread human rights violations and hardship to civilians in Gaza. Palestinian hospital officials say 51 Palestinians have been killed in the offensive, with more than 180 wounded. One Israeli soldier was killed last week. Military officials said Sunday that an initial inquiry showed he was shot accidentally by Israeli forces. Olmert and other ministers said they were not overly concerned about the international reaction. "Anybody who calls this operation disproportionate has no clue about the facts on the ground. We have been attacked and bombarded for months and weeks," Cabinet minister Yitzhak Herzog said. "With all due respect to all those who criticize us, if anything of this nature would have happened in their homeland, they would have acted much worse."